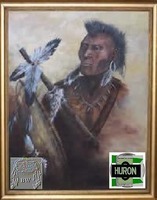 TOTIRI (Totihri), Étienne, Huron Indian, staunch Christian convert, resident of the village of Teanaostaiaë or Teanaustayé (near Hillsdale, Ontario); fl. 1642–46. In 1642 Totiri, who was of an influential family, gave over to the Jesuits the end of his cabin, where corn and wood were usually stored. A little chapel, dedicated to Saint-Joseph, was built in “that cabin’s end.” To be convenient, the priests also lodged with Totiri. He showered with a thousand courtesies the two Frenchmen who came to work on the chapel. Because of the support he gave the priests, Totiri suffered at the hands of non-Christian villagers who blamed the Jesuits for the disease, famine, and wars that were sweeping their country. With zeal and valour, he led the Christian converts in the face of ostracism, calumnies, and violence. He became custodian of the chapel and instructed male converts in the Christian beliefs; his wife, Madeleine, his equal in intelligence and virtue, instructed the women converts. “Estienne makes of his Cabin a School of devotion,” Father Garnier wrote in 1643. When no priest could be spared, Totiri and his brother carried on the mission to the Neutral Indians in the winter of 1643–44. They stayed in one of the villages “nearer the frontier,” while another Huron convert, Barnabé Otsinnonannhont of the Neutral village of Saint-Michel, “penetrated to the heart of the country” and remained longer, for he had great authority among them, and also many relatives. As a result, 100 Neutrals visited the Hurons to witness the Christian church in action. In 1646 Totiri was described as dogique of the village, carrying on the work of the priests in their absence. Teanaostaiaë, however, was particularly attached to the ancient beliefs and customs. Fearing a departure from them and regarding the new faith as too rigorous, the captains of the village renewed their attacks against the Christians. When a cross, erected in the cemetery by the Jesuits, was attacked by children, Totiri mounted his roof-top and in an “astounding” loud voice, such as was used when the enemy approached, assembled the people and spoke so forcibly against such practices that parents henceforth repressed their children’s insolence. As well as his wife, his daughter Catherine, and his brother Paul, Totiri’s mother, Christine, Tarihia was a devout Christian after her baptism in 1639. She requested, at her death in the winter of 1643–44 to be buried in the Christian cemetery at Sainte-Marie, some six leagues distant from Teanaostaiaë, the second person to be buried there. JR (Thwaites), passim. Desrosiers, Iroquoisie, 244. Elsie McLeod Jury, “TOTIRI, Étienne,” in Dictionary of Canadian Biography, vol. 1, University of Toronto/Université Laval, 2003–, accessed April 26, 2019, http://www.biographi.ca/en/bio/totiri_1E.html.